The Greater San Fernando Valley Chapter of the Association of Fundraising Professionals (AFP GSFV) is one of the most active chapters in the Los Angeles area, offering members the opportunity to connect with colleagues, engage in creative thinking, network with new friends and achieve great results in their work. We focus on delivering innovative educational programs and events to help you reach your goals. 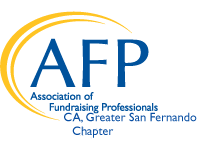 AFP GSFV is your link to professional development luncheons; meet the funder programs; live webinars, and CFRE prep groups. We also offer opportunities for volunteering, special events like National Philanthropy Day, and our Fundraising Education Conference. Make AFP GSFV work for you! Contact us at info@afp-gsfv.org to learn more and get involved! As of July 1, 2019, membership dues for Professional and Associate members will increase by $30. This is the first increase in the past ten years, and allows AFP to continue developing and enhancing member benefits. Revamped communications, such as AFP Daily and the Week in Review, which provide timely updates and sector news—provided free of charge to members. The dues increase recommendation is also based upon findings from the Value Proposition and Member Pricing Research Survey, which found that the optimal price for the professional or associate membership was found to be between $250 and $290. Even with the $30 dues increase, the new rate remains within the optimal level. The task force also recommended a bylaws change to reflect a dues increase of 2% every two years (rounded up or down to the nearest $5 increment) to continually keep up with inflation. The other membership categories will stay the same.